You are able to edit and enhance photos uploaded to your Sam’s Club Photo Center account before printing, framing or creating photo gifts with them. Once you are logged in, select View Photos from the main menu. Click on the album that contains the photo that you want to edit. Then, click Edit below the specific photo to open the editing tool. When you are finished editing your photo, click save to apply your changes. Click undo to reverse all edits. Note: If you prefer, you can duplicate the original version of your photo before making any edits. 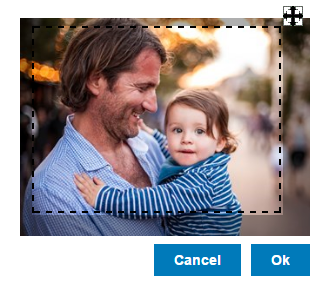 Click the checkmark beneath the photo, click copy, then select the destination album for the duplicated photo. Cropping your photo is an effective way to trim unwanted elements or to fit your photo into a standard print size. Cropping a digital photo means removing pixels to fit a photo to a new aspect ratio. Click on a size to crop your image to that size. Then, click and drag your photo to adjust its positioning and click Ok. The quality of your image is impacted by its resolution. We will warn you if you choose a size or crop your image to a size that would result in a blurry or pixelated print. Learn more about image resolution. Select the desired orientation for your photo: landscape (horizontal) or portrait (vertical). Pictures taken with a flash will sometimes cause eyes to appear red. Click the red eye button on the left to apply red-eye correction to your image. When you have finished editing your photo and saved your changes, click Add to Cart to add the print in your selected print size to your shopping cart.